Start off your visit on the 22nd (Mon): Head underground at Syvasenvaara Fell and then experience the excitement of Feelapland. 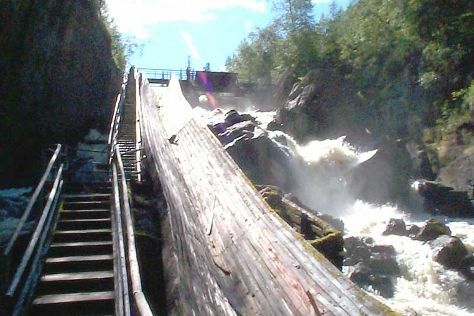 On the next day, take in the views from Lumberjack's Candle Bridge, then get lost in a book at Rovaniemi City Library, then stop by LAURI, and finally admire the sheer force of Auttikongas. To see maps, more things to do, where to stay, and tourist information, go to the Rovaniemi online tour planner . Strasbourg, France to Rovaniemi is an approximately 10-hour combination of train and flight. You can also fly; or drive. The time zone difference moving from Central European Time (CET) to Eastern European Time (EET) is 1 hour. Expect much colder weather when traveling from Strasbourg in April: highs in Rovaniemi hover around 3°C, while lows dip to -3°C. Finish your sightseeing early on the 23rd (Tue) so you can travel to Helsinki. Visiting Teijo national park and Arboretum Mustila will get you outdoors. You'll explore the less-touristy side of things at Bellevue Beach and Castle Hill. Explore the numerous day-trip ideas around Helsinki: Linden Esplanade (in Kotka) and The Old Water Tower of Ekenas (in Raseborg). There's more to do: test your team's savvy at popular escape rooms and take a stroll through Ullanlinna. For photos, reviews, and more tourist information, refer to the Helsinki trip planning app . Fly from Rovaniemi to Helsinki in 4 hours. Alternatively, you can do a combination of train and flight; or drive. In April, Helsinki is somewhat warmer than Rovaniemi - with highs of 9°C and lows of 0°C. Wrap up your sightseeing on the 27th (Sat) early enough to travel back home.